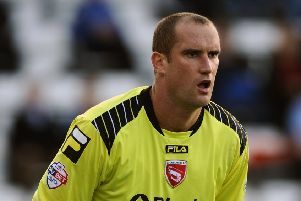 Morecambe defender Ryan Edwards is set to miss out again at Wycombe on Saturday. The big centre half picked up a back injury in the game against York on April 14 and missed the 2-1 defeat against Burton last time out. Shrimps boss Jim Bentley said: “It’s a swelling in one of his discs so we can’t take any chances with that. Barry Roche made a welcome return to the bench against Burton but the Shrimps’ number one could miss out against the Chairboys as his recovery from hip surgery is carefully managed. Bentley said: “Baz has been training quite well and was on the bench in the last game but he’s just probably done a little bit too much too soon so we’ve had to ease him back. Ryan Williams will also be unavailable as he continues his recovery from a hernia operation.